Dairy Technology, Ethiopian Institute of Agricultural Research (EIAR), Holetta Research Center, P.O. Box 2003, Addis Ababa, Ethiopia. Production wise, barley is the fourth among the major cereal crops in the world. The grain is mainly exploited as feed or as raw material for malt production, with only a small fraction, about three percent of the total produce currently being used for human food purpose. Widespread use of maize, wheat, and rice as main food grains has presently relegated barley to the underutilized status. Poor baking quality and grey/dark color development on cooking, probably, have discouraged the use of barley in human food. However, composition wise, barley contains starch as the main carbohydrate, low fat, protein of moderate quality, minerals, vitamins, especially vitamin E (tocopherols and tocotrienols) and other antioxidants, mainly polyphenolics, and insoluble and soluble dietary fiber, i.e., β-glucans, chemically (1-3,1-4)-β-D-glucans. Recent researches have claimed, because of β-glucans, consumption of barley in food offers several health benefits to alleviate the problems of life style disorder. These include control of blood cholesterol and glucose level, and induction of satiety effect required to control body weight. Barley’s potential as a prebiotic has increased significantly as β-glucans promote the growth of beneficial intestinal microorganisms. Besides these, tocotrienols as antioxidants have been the focus of growing research interest for their hypocholesterolemic action. Additionally, tocotrienols may affect the growth and/or proliferation of several types of human cancer cells. To utilize the impressive health benefits, incorporation of barley in food may be advocated through improved technology to overcome the so called undesirable effects. However, in line with the increasing health consciousness, several whole grain products are now getting popularized with sacrifice of desirable colors. It is appreciated that through sustained research and development, barley, currently underutilized, will be considered as a prized food for good nutrition and health in near future. Escherichia coli O157:H7, Ergo, Ayib, Fermented milk products, Challenge test. Milk and milk products are important in the diet of Ethiopians. Ergo is a naturally fermented milk at ambient temperature, which can be served directly as a refreshment or used as a raw material for the production of shelf stable milk products such as butter and Ayib (Ethiopian cottage cheese). Ergo is churned to produce butter using traditional churns such as clay pot and calabash. The defatted fermented milk, which is obtained as a byproduct of the butter-making process, is heated on a low fire (40-70°C) [1-3] for the manufacturing of Ayib. The curd (Ayib), separated from the whey, can be stored up to 7 days at 30°C . Milk and milk products can be contaminated from sources such as diseased milking cows, milk handlers, contaminated equipment or cleaning water. Since its identification as an emerging pathogen in 1982 , Escherichia coli 0157:H7 continued to be an important foodborne pathogen of great public health concern. Health disorders caused by E. coli O157:H7 range from self-limited, watery and bloody diarrhea to Hemolytic Uremic Syndrome (HUS)  and Thrombotic Thrombocytopenic Purpura (TTP)  that is more severe and life threatening. A wide variety of foods, including beef , mayonnaise , apple cider  and apple juice  have been reported to be vehicles of E. coli O157:H7 infections. Milk and milk products including raw milk [9,12], fresh cheese curds, yogurt  have been reported to be associated with several cases and outbreaks of E. coli O157:H7 infections. Although acid foods have generally been considered to be intrinsically safe due to their low pH and high acidity, diseases including E. coli O157:H7 infections have been reported to be caused through the consumption of such foods. Survival of E. coli O157:H7 in traditional African yogurt fermentation was reported . The increased acid tolerance of E. coli O157:H7 than other E. coli strains and its survival in many acid foods are documented . Massa  also indicated that Escherichia coli O157:H7 population did not change significantly after 24 h in traditional yogurt. However, information on the fate of Escherichia coli O157:H7 during Ergo-making is very limited and that on Ayib-making is lacking. The aim of this study was therefore to investigate the effect of fermentation of milk at ambient temperature and cooking of defatted fermented milk at different temperatures on the growth and survival of Escherichia coli O157:H7. The milk sample used in the present study was commercial micro-filtered milk. The strain Escherichia coli O157:H7 (Ref. N°. CIP 103571) used for the challenge test was purchased from Pasteur Institute (Paris, France). A mixture of cocci and rode shaped Lactic Acid Bacteria (LAB) isolated from naturally fermented milk that were Gram+, catalase– and oxydase– were used to initiate fermentation. Prior to carrying out the challenge test, this LAB mixture was inoculated in sterile milk and left to ferment at ambient temperature for around 36 h. This fermented milk was then examined for its organoleptic properties by a panel of 4 persons and confirmed to conform to the characteristics of naturally fermented milk. Micro-filtered milk was aseptically distributed into sterile screw-capped bottles to get final volumes of approximately 100 mL in each bottle. Milk was then left to ferment at ambient temperature for about 72 h.
In this experiment, Ayib was made according to the traditional procedure by cooking defatted fermented milk (72 h of fermentation at ambient temperature, 20 – 25°C) with E. coli O157:H7 being inoculated at 0 h of fermentation. The cream layer was removed aseptically from the fermented milk before the start of the cooking. Three Ayib-making temperatures (50, 60 and 70°C) were used based on the practice in the study area. Products were kept in a water bath adjusted at 50, 60 and 70°C. Internal temperature of products was measured by inserting a thermometer inside the products and when the predefined internal temperatures were achieved, cooking continued for 60 min. Four initial inoculum levels of E. coli O157:H7 were used: High (~3x105 cfu mL-1), medium (~3x104 cfu mL-1), low (~3x103 cfu mL-1) and very low (~3x102 cfu mL-1). A control milk (~3x102 cfu mL-1) with no LAB was also used. LAB was inoculated to obtain initial count of ~3x105 cfu mL-1 to initiate fermentation in all treatments except the control milk. Initial inoculum levels were estimated by adjusting to Mac Farland standard corresponding to concentration of microbial suspension using spectrophotometer (Spectronic 1202, Milton Roy). Suspensions were prepared in 0.1% peptone water (Oxoid, UK) from overnight grown Escherichia coliO157:H7 culture on nutrient agar and in MRS broth from culture grown on MRS agar (48 h at 35°C). The growth and survival of organisms were monitored by drawing 1 mL portion of the fermenting milk at 0, 8, 24, 32, 48, 56 and 72 h of fermentation. During Ayib-making, 1 mL or g of the product was drawn at 0, 20, 40 and 60 min of cooking from each treatment and the control groups. Test portions were directly mixed in test tubes containing 9 mL of 0.1% peptone water (Oxoid, UK) for E. coli O157:H7 and MRS broth (Oxoid, UK) for LAB. Zero point one mL of appropriate dilutions were surface plated on duplicate Sorbitol MacConkey agar with 5-bromo-4-chloro-3-indolyl-β-D-glucuronide (SMAC-BCIG) (Oxoid, UK) plates for the enumeration of viable E. coli O157:H7. LAB was enumerated after culturing duplicate surface plated MRS agar plates in an aerobic jar (Biorad, France) at 35°C for 48 h.
The pH of the fermenting milk was measured at the time of sampling for microbial analysis by inserting the electrode of the digital pH meter (pH 330, Bioblock Scientific, Germany) into sample portions in a test tube. Each experiment was replicated three times. Populations of Escherichia coli O157:H7 and LAB surviving fermentation during Ergo-making and heat treatment during Ayib-making were transformed to log10 values before subjecting to statistical analysis. Log transformed values (cfu mL-1 or g-1) and pH determined at each sampling time of the test portion from the fermenting milk were analyzed using the General Linear Model (GLM) of the Statistical Analysis System. Least Significant Difference (LSD) test was used to separate means and differences were considered to be statistically significant when P<0.05. Escherichia coli O157:H7 showed similar growth patterns at different initial inoculum levels with or without the presence of LAB in fermenting milk at ambient temperature for 72 h (Figure 1). E. coli O157:H7 population first increased (p<0.05) up to between 8 and 32 h of fermentation depending on initial inoculum levels then declined towards the end of fermentation at 72 h at which time counts decreased by 1.2, 0.3 and 0.5 log cfu mL-1 for high, medium and low initial inoculum levels, respectively from the initial counts. At very low initial inoculum level and in control milk with no LAB, however, E. coli O157:H7 count increased respectively by 0.2 and 1.2 log cfu mL-1. LAB counts increased (P<0.05) up to 32 h of milk fermentation at ambient temperature and then declined towards the end of fermentation at 72 h at which time LAB counts increased by up to 0.6 log cfu mL-1 from the initial count. These trends were accompanied by a progressive decrease in pH from an average of 6.57 at the start of fermentation to an average of 4.4 and 5.04 when E. coli O157:H7 was co-inoculated with LAB and in the control milk with no LAB, respectively (p<0.05). 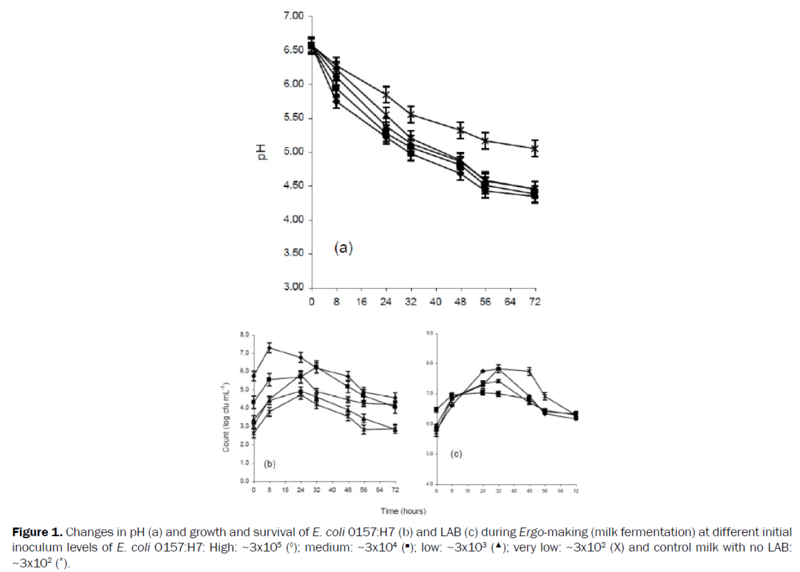 Figure 1: Changes in pH (a) and growth and survival of E. coli 0157:H7 (b) and LAB (c) during Ergo-making (milk fermentation) at different initial inoculum levels of E. coli O157:H7: High: ~3x105 (◊); medium: ~3x104 (■); low: ~3x103 (▲); very low: ~3x102 (X) and control milk with no LAB: ~3x102 (*). The changes in the survival of E. coli O157:H7 and LAB during Ayib-making were different according to cooking temperatures (Figure 2). LAB survived the three cooking temperatures considered during Ayib-making. LAB numbers dropped from around 6.3 log cfu mL-1 of initial count to 3.1 - 4.8, 2.9 - 36 and 0 - 2 log cfu mL-1 (p<0.05) at the end of cooking at 50, 60 and 70°C cooking temperatures, respectively (Figure 2). E. coli O157:H7 was inactivated below plating-detection limit (<10 cfu mL-1) between 40 and 60 min of cooking at 50 and 60°C and between 0 and 20 min of cooking at 70°C when inoculated at low and very low initial inoculum levels. At high and medium initial inoculum levels; and in the control milk with no LAB, however, E. coli O157:H7 survived 60 min of cooking with reduction in number respectively by 1.6, 1.7 and 1.8 log cfu mL-1 or g-1 at 50°C; and 3.7, 3.1 and 2.7 log cfu mL-1 or g-1 at 60°C cooking temperatures (p<0.05). When Ayib was made by cooking defatted fermented milk with high and medium initial inoculum levels and control milk with no LAB, E. coli O157:H7 count dropped by 2.5, 3 and 1.8 log cfu mL-1 or g-1, respectively, and was not detected when determined at 40 min of cooking (Figure 2). Figure 2: Survival of Escherichia coli 0157:H7 at 50°C (a), 60°C (b) and 70°C (c) and LAB at 50°C (d), 60°C (e) and 70°C (f) during Ayib-making at high (◊), medium (■), low (▲), very low (X) and control milk with no LAB (*) initial inoculum levels of E. coli O157:H7. The current study focused on assessing the growth and survival of Escherichia coli O157:H7 during the fermentation of milk at ambient temperature for Ergo–making and heating of defatted fermented milk for the manufacturing of Ayib. Information on the growth and survival of Escherichia coli O157:H7 during traditional food manufacturing in general and milk processing in particular is generally scarce in Ethiopia. A combination of factors including low pH and the production of bacteriocin, hydrogen peroxide, and ethanol by LAB were reported to have an inhibitory effect on E. coli O157:H7 in fermenting milk . E. coli O157:H7 was reportedly more acid-resistant as compared to Salmonella Typhimurium DT104 and Listeria monocytogenes  and possess an inherently high permanent acid resistance . Although, a wide pH range of 4.0–9.0 with optimum pH being 7 was reported for the survival of E. coli O157:H7 , survival of the organism at pH levels as low as 2.0 and as high as 11.0 was indicated . The survival of E. coli O157:H7 at pH values of 3.7 in apple cider , 3.1 in mustard  and 3.65 in mayonnaise  was reported. In the present study, Escherichia coli O157:H7 survived in fermenting milk up to 72 h with cell counts ranged between 2.8 and 4.5 cfu mL-1 based on initial inoculum levels. E. coli O157:H7 counts increased by 2.1 log cfu mL-1 after 24 h and 0.2 log cfu mL-1 after 72 h of fermentation from initial count of 2.6 cfu mL-1. Our result agrees with that of Kasimoglu and Akgun  who reported that E. coli O157:H7 cells increased from initial numbers of 102, 104 and 106 cfu mL-1 to 103, 105 and 107 cfu mL-1 respectively in traditional yogurt (pH 4.6) after 3 h of fermentation. Tsegaye and Ashenafi  also reported a similar trend in the same type of product. Although acid–adaptation was reportedly increased the survival of pathogens such as E. coli O157:H7 in different food stress conditions [18,22,23], a higher survival population of non-acid-adapted than acid-adapted was noted in milk . Most bacteria require an adaptation period to acid in order to exhibit an increased acid tolerance response; and acid adaptation was reported to enhance survival of Escherichia coli O157:H7 . As indicated by Archer  long-term survival of acid-adapted pathogens at low pH may trigger mutations of permanent acid stress resistance and of increased virulence. Because of the acid tolerance of E. coli O157:H7, the final pH of Ergo (on average 4.4 in this study) was insufficient to prevent the survival of the organism in the product. A similar observation was made by  for yogurt. E. coli O157:H7 grows best within a temperature range of 30 to 42°C, the optimal temperature being 37°C . Although, Raghubeer and Matches  reported that E. coli O157:H7 does not grow well at 44 to 45.5°C, in the present study viable E. coli O157:H7 cells were recovered after 60 and 20 min of cooking defatted fermented milk at 60 and 70°C, respectively. Spano  indicated that E. coli O157:H7 disappeared completely during stretching of curd for 5 min in hot water (80°C) during the manufacturing of Mozzarella. According to Buchanan and Edelson  and Murano and Pierson  the survival of acid-adapted pathogens increased against other stresses, such as heat. In the present study, E. coli O157:H7 population decreased only by 1.2, 0.3 and 0.5 log cfu mL-1 after 72 h of fermentation at ambient temperature from initial counts of 5.7, 4.3 and 3.3 log cfu mL-1, respectively. Counts increased from 2.6 and 3.0 log cfu mL-1 at the start of fermentation to 2.8 and 4.2 log cfu mL-1 at the end of fermentation when co-inoculated with LAB and in control milk with no LAB, respectively. At 24 h of fermentation E. coli O157:H7 number ranged from 4.7 to 7.3 log cfu mL-1 depending on initial inoculum levels at which time Ergo is directly consumed due to its preferred flavor . The infective dose of E. coli O157:H7, on the other hand, is reportedly very low ranging from 2 to 100 E. coli O157:H7 viable cells depending on the food involved [35-39]. The direct consumption of Ergo, therefore, can represent an important source of E. coli O157:H7 infection. From the results of the current study it can be concluded that, at the inoculum levels studied, the use of cooking temperature of 70°C for at least 40 min during Ayib-making is necessary to inactivate E. coli O157:H7. This work was financed by the French embassy in Ethiopia and International Foundation for Science (IFS). Gonfa A, et al. The microbiological aspects of Ergo(ititu) fermentation, SINET: Ethiop. J. Sci.1999;22, 2. FAO. The technology of traditional milk products in developing countries. FAO Animal Production and Health Paper 85. Food and Agriculture Organization of the United Nations, Rome, Italy. 1990; 333. O’Connor CB.Rural dairy technology. ILRI training manual 1. ILRI (International Livestock Research Institute), Addis Ababa, Ethiopia 1994; 133. O’Connor CB. Traditional cheese making manual. International Livestock Center for Africa (ILCA), Addis Ababa, Ethiopia 1993; 43. Riley LW, et al. Hemorrhagic colitis associated with a rare Escherichia coli serotype,N. Engl. J. Med.1983; 308: 681-685. Griffin PM and Tauxe R V. The epidemiology of infections caused by EscherichiacoliO157:H7, other enterohaemorrhagicE. coli and the associated hemolytic uremoicsyndrome,Epidemiol. Rev 1991; 13: 60-98. Doyle M P and Schoeni JL. Isolation of Escherichia coli O157:H7 from retail fresh meats and poultry. Appl. Envir. Microbiol. 1987; 53:2394-2396. WillshawGA, et al.Verocytotoxin-producing Escherichia coli O157:H7 in beef burgers linked to an outbreak of diarrhoea, haemorrhagic colitis and haemolyticuraemicsyndrom in Britain,Letters inAppl. Microbiol. 1994; 19: 304-307. Marks S and Roberts T.Escherichia coli O157:H7 ranks as fourth most costly foodborne disease. Food Review 1993; 51-55. Besser RE, et al. An outbreak of diarrhea and hemolytic uremic syndrome from Escherichia coliO157 : H7 in fresh-pressed apple cider. JAMA 1993; 269: 2217-2220. USDA/FSIS. Escherichia coli O157:H7 outbreak associated with odwalla brand apple juice products. Washington D.C.1996; 96-17. Clarke RC, et al. Isolation of verocytotoxin-producing Escherichia coli from milk filters in south-western Ontario, Epidemiology Infection 1989; 102, 253-260. Durch J, et al. Outbreak of Escherichia coli O157:H7 infection associated with eating fresh cheese curds 2000. Morgan D, et al.Verotoxin-producing Escherichia coli O157:H7 infections associated with the consumption of yogurt. Epidemiol. Infect.1993; 111: 181-187. Ogwaro B A, et al. Survival of Escherichia coli O157:H7 in traditional African yogurt fermentation. Int. J. Food Microbiol2002; 79:105-112. Massa S, et al. Survival of Escherichia coli O157:H7 in yogurt during preparation and storage at 4 °C. Letters Appl. Microbiol. 1997; 24:347-350. Frank JF and Marth E H. Fermentation. In: Wong, N. P. Jenness, R., Keeney, M., Marth, E. H. (Eds. ), Foundamentals of Dairy Chemistry. Van Nostrand-Reinhold, New York, 1988; 655-738. SamelisJ, et al. Evaluation of pH-dependent stationary phase acid tolerance in Listeria monocytogenes and SalmonellaTyphimurium DT104 induced by culturing in media with 1% glucose: a comparative study with Escherichia coli O157:H7. J. Appl. Microbiol.2003; 95: 563-575. Benjamin MM and Data AR. Acid tolerance of EnterohemorragicEscherichiacoli. Appl. Envir. Microbiol. 1995; 61:1669-1672. Forsythe S J. The microbiology of safe food. Department of Life Sciences, Nottingham Trent University, Blackwell Science, UK 2002. Miller LG and Kaspar CW. Escherichia coli O157:H7 acid tolerance and survival in apple cider,J. Food Prot.1995; 57: 460-464. Tsai YW and Ingham S C. Survival of Escherichia coli O157:H7 and Salmonellaspp. in acidic condiments. J. Food Prot.1997;60:751-755. Weagant SD, et al. Survival of Escherichia coli O157:H7 in mayonnaise-based sauces at room and refrigerated temperatures. Journal of Food Protection 1994; 57: 629-631. Kasimoglu A. and Akgun S. Survival of Escherichia coli O157:H7 in the processing and post-processing stages of acidophilus yogurt. Int. J. Food Sci. Tech. 2004; 39:563-568. Tsegaye M and Ashenafi M. Fate of Eschericia coli O157:H7 during the processing and storage of Ergo and Ayib, Traditional Ethiopian dairy products,Int. J. FoodMicrobiol. 2005; 103: 11-21. Hsin-Yi C and Chou CC. Acid adaptation and temperature effect on the survival of E. coliO157:H7 in acidic fruit juice and lactic fermented milk product,Int. J. Food Microbiol.70:189-195. LeyerGJ, et al. Acid adaptation of Escherichia coli O157:H7 increases survival in acid foods,Appl. Envir. Microbiol.1995; 61: 3752-3755. Archer DL. Preservation microbiology and safety: evidence that stress enhances virulence and triggers adaptive mutations. Trends in Food science and Technology1996; 7: 91-95. Duffy G, et al. A European Study on Animal Food & Biomedical aspects of E. Coli0157:H7. The National Food Centre, Dunsinea, Castleknock, Dublin, Irland 2002. Raghubeer EF and Matches JR. Temperature range for growth of Escherichia coliserotype O157:H7 and selected coliforms in E. coli medium. J. Clin. Microbiol.1990; 28:803-805. Spano G, et al.Fate of Escherichia coliO157:H7 during the manufacture of Mozzarella cheese.Letters Appl. Microbiol. 2003;36: 73-76. BuchananRL, and Edelson SG. Effect of pH-dependent, stationary phase acid resistance on the thermal tolerance of Escherichia coli O157:H7. Food Microbiology1996; 16: 447-458. Murano EA and Pierson MD. Effect of heat shock and incubation atmosphere on injury and recovery of Escherichia coliO157:H7. J. Food Prot.1993; 56, 568-572. AshenafiM.Fate of SalmonellaEnteritidisand SalmonellaTyphimurium during the fermentation of ergo, a traditional Ethiopian sour milk,Ethiop Med J, 1993; 31:91-98. Paton JC and Paton AW. Pathogenesis and diagnosis of shiga toxin-producing Escherichia coliinfections,Clin. Microbiolol. Reviews.1998; 11: 450-479. Tilden J, et al. A new route of transmission for Escherichia coli: infection from dry fermented salami. Am.J. Public Health. 1996;86: 1142-1145. Morbidity Mortality Weekly Report49, 911-913. Padhye NV and Doyle MP. Escherichia coli O57:H7: Epidemiology, pathogenesis, and methods for detection in food. J. Food Protect.1992; 55: 555-565. SAS. User's guide: Statistics, version 5, SAS Institute. Statistical Analysis System (SAS). Inc. Cary, NC 2001.